We evaluated the universal funding program for pediatric insulin pumps in Ontario by examining the dynamics underlying patterns of pump use and adverse events using population-based health administrative data available at the Institute for Clinical Evaluative Sciences (ICES), supplemented by other data. We found that (1) pump use has increased steadily since 2006 with variation across centres and disparity in use by socioeconomic status; (2) pump discontinuation is uncommon; (3) physicians value pump therapy in numerous ways that provide important insights into patterns of uptake; and (4) the safety profile of pump therapy is, in general, very good; however, individuals of lower socioeconomic status are at an increased risk of acute diabetes complications, most frequently diabetic ketoacidosis. This comprehensive mixed-methods evaluation reveals the need to understand and intervene to reduce social disparities in the use and adverse outcomes of technologies used for diabetes management. Technologies used for managing chronic diseases such as diabetes come with high expectations, making them more likely to be adopted; however, they often bring marginal benefits at increased costs (Anderson et al. 2008; Berwick 2003; Canadian Institute for Health Information 2011; James Lind Alliance 2016). Insulin pumps for children with type 1 diabetes exemplify such challenges, with these being broadly adopted in countries with middle-to-high incidences of type 1 diabetes despite equivocal evidence about comparative long-term effectiveness with insulin injection therapy (Nuboer et al. 2006; Phillip et al. 2007; Sulmont et al. 2011). Many longitudinal studies show an improvement in the level of hemoglobin A1c (HbA1c) – a measure of glycemic control – within the first year of starting pump therapy; however, it appears that the level of HbA1c reverts back towards the baseline thereafter (Shulman et al. 2012). In addition, the impact of pump therapy on the rate of hypoglycemia is mixed, although the rate of diabetic ketoacidosis (DKA), a preventable and life-threatening complication of type 1 diabetes, does not appear to be increased in patients using pump therapy (Shulman et al. 2012). This raises complex questions about the valuation, real-world effectiveness and adequate implementation of a new technology – a challenge for health services delivery and policy development. The Diabetes Control and Complications Trial showed that long-term complications of diabetes could be reduced by providing intensive insulin therapy through multiple daily injections or an insulin pump (Diabetes Control and Complications Trial Research Group 1994; Nathan et al. 2005). Pump therapy allows for increased flexibility in daily life and eliminates the need for multiple daily injections; therefore, its use has increased markedly in pediatric contexts (Hofer et al. 2010; Olsen et al. 2015; Shulman et al. 2012). Accordingly, in 2006, the Ontario Ministry of Health and Long-Term Care (MOHLTC) announced funding for insulin pumps and related supplies for all children with type 1 diabetes up to the age of 19 years; this facility was provided because of public and professional interest in the pump's potential for optimizing glucose control and to address the two-tiered funding situation that had developed, despite equivocal evidence about long-term comparative effectiveness. As part of a comprehensive mixed-methods evaluation of this policy decision, we evaluated the dynamics underlying patterns of pump use and adverse events in the following ways: (1) the value physicians place on pump therapy to understand patterns of pump use and inform decisions about funding technology for children with diabetes (Shulman et al. 2016a); (2) the characteristics and resources of pediatric diabetes centres (Shulman et al. 2016b); (3) the manner in which the program is used by centres and by individuals (Shulman et al. 2016c); and (4) the safety profile of pump therapy (Shulman et al. 2016d). The Network of Ontario Pediatric Diabetes Programs, under the mandate of the Northern Diabetes Health Network, was established in 2001 to improve access to specialized diabetes care for all children in Ontario. In 2013, this mandate was assumed by the Ontario Paediatric Diabetes Network (OPDN) and coordinated by the Provincial Council for Maternal and Child Health, a program of the MOHLTC. The OPDN currently comprises 35 centres, including 30 community and 5 tertiary centres, each employing physicians, nurses, dietitians and social workers with training in diabetes care. Our evaluation capitalizes on population-based health administrative data from the MOHLTC available for research purposes at ICES, and uses quantitative data on centre practices and qualitative data on provider expectations to illuminate core findings from the administrative data analysis. This mixed-methods approach may be useful to inform funding decisions and implementation processes for technologies used for treatment of diabetes more generally. 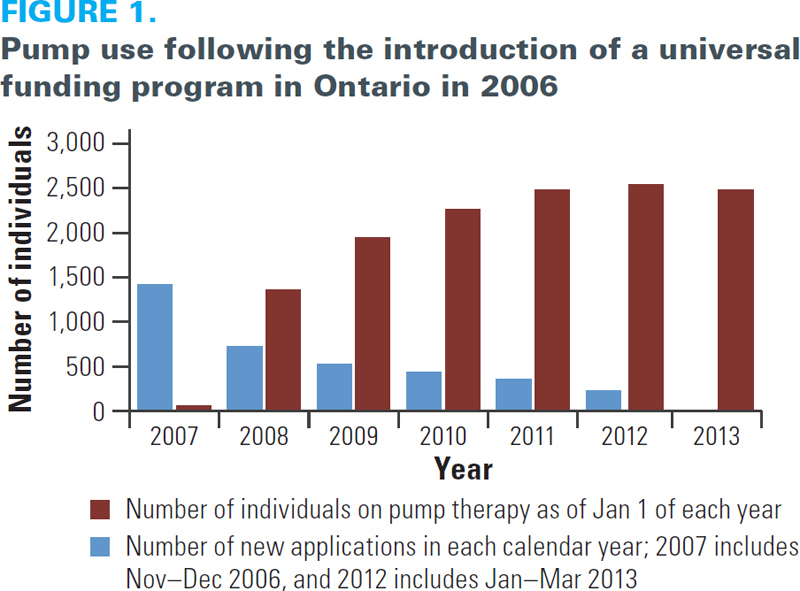 Pump use has increased in Ontario since 2006; by 2012, 38% of all children with type 1 diabetes were using pumps (Figure 1). Pump discontinuation is uncommon, suggesting that early enthusiasm does not wane and/or result in higher downstream rates of discontinuation. 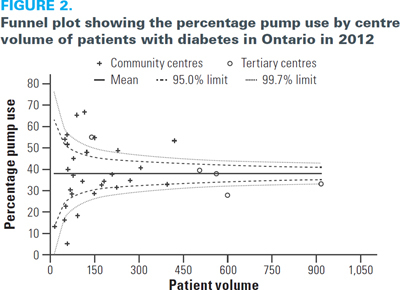 However, we observed a large variation in pump use across centres (Figure 2) (Shulman et al. 2016c). We were unable to identify any centre-level characteristics, such as centre type (tertiary, large or small community), that were associated with uptake. However, our qualitative study about how physicians value pump therapy provides several important insights into factors that may influence uptake. Enthusiasm may stem, in part, from the idea that novel technologies are inherently appealing to patients and their families; from physicians' own enthusiasm for pump therapy because of what it might achieve in the future; for the social benefits it confers for patients; and as a tool to motivate patients to improve their diabetes self-management (Shulman et al. 2016a). Although we report an increase in pump use, we also observed disparity in use by socioeconomic status; pump users were more likely than non-pump users with diabetes to be in the highest-income quintile (29.6 vs. 19.1%, p < 0.0001) (Shulman et al. 2016c). This may relate, in part, to the cost of pump therapy, as the additional cost of supplies (25% not covered by the government) may be a financial barrier for low-income families. Further, the findings of our qualitative study suggest that the degree of available ancillary support for diabetes management (family, school) influences physicians' predisposition to recommend pump therapy (Shulman et al. 2016a). Increased use of the pump enabled by government funding may lead to widespread benefit; however, it may also result in inappropriate use, causing harm. 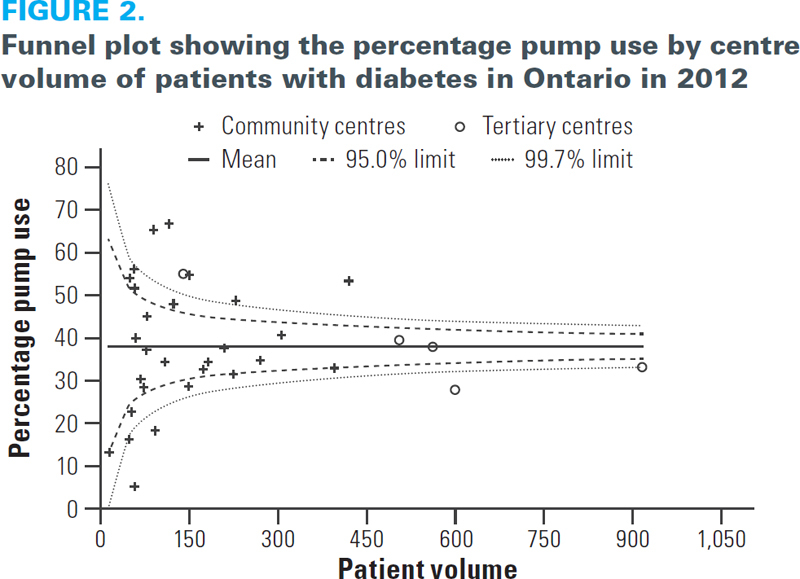 Yet, despite the rapid increase in pediatric pump use in Ontario, the rate of DKA (5.28/100 person-years) (Shulman et al. 2016d) is similar to that reported in other population-based studies of pediatric pump users (6.26/100 person-years) (Danne et al. 2008). Although no causal association can be inferred, the DKA rate among those beginning pump therapy was not higher in the period after initiation compared with that two years before. 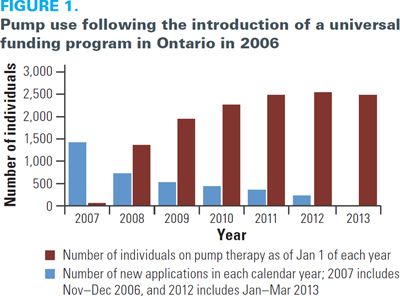 Also reassuring is that the risk of DKA or death in the first two years of pump use was exceedingly low, suggesting that initial pump use education and implementation of the funding program in Ontario were effective. Although the safety profile of pump therapy in this context is good, compared with individuals in the least deprived quintile, the risk of DKA or death for those in the most deprived quintile was significantly higher (hazard ratio = 1.58, 95% confidence interval [CI] = 1.05–2.38) as was the rate of diabetes-related acute care use (risk ratio = 1.60, 95% CI = 1.27–2.00). Although we could not explore why this is the case, these children may have less robust family or school supports – key factors that physicians view as important to achieving favourable outcomes (Shulman et al. 2016a). Provision of 24-h support was not associated with these outcomes. Higher glycated hemoglobin, history of DKA, older age and higher nursing patient load were associated with a higher risk of DKA or death and diabetes-related admissions and emergency department visits. This suggests the need for targeted interventions and additional support for groups of youth with type 1 diabetes who are at the highest risk for adverse events. This comprehensive evaluation reveals the need to understand and intervene to reduce social disparities in use and adverse outcomes of technologies used for treatment of diabetes. As new programs and policies for pediatric diabetes care are developed, we should anticipate how potential benefits and harms may be distributed across social gradients and aim to reduce the existing disparities. It is important to evaluate new programs and policies to determine their overall impact and the distribution of the impact across social gradients. These new technologies should be universally available to prevent creation of a two-tier treatment approach based on socioeconomic status. Fiona A. Miller, PhD, is an associate professor of health policy in the Institute of Health Policy, Management and Evaluation; director of the Division of Health Policy and Ethics at the Toronto Health Economics and Technology Assessment Collaborative (THETA); and a member of the Joint Centre for Bioethics at the University of Toronto. Thérèse A. Stukel, PhD, is a senior core scientist at ICES and a professor at the Institute of Health Policy, Management and Evaluation, University of Toronto. Denis Daneman, MBBCh, DSc(Med), is a professor and chair emeritus of pediatrics at the University of Toronto and pediatrician-in-chief emeritus at The Hospital for Sick Children in Toronto. Astrid Guttmann, MDCM, MSc, is the chief science officer at ICES, a staff pediatrician in the Division of Paediatric Medicine at The Hospital for Sick Children, and an associate professor in the Department of Paediatrics and the Institute of Health Policy, Management and Evaluation at the University of Toronto. Rayzel Shulman received salary support from the Canadian Child Health Clinician Scientist Program for her PhD. Denis Daneman is the R.S. McLaughlin Foundation Chair in Paediatrics. Astrid Guttmann receives salary support from a Canadian Institute for Health Research Applied Chair in Reproductive and Child Health Services and Policy Research. Anderson, G.M., D. Juurlink and A.S. Detsky. 2008. "Newly Approved Does Not Always Mean New and Improved." JAMA 299(13): 1598–600. Berwick, D.M. 2003. "Disseminating Innovations in Health Care." JAMA 289(15): 1969–75. Canadian Institute for Health Information. 2011. Health Care Cost Drivers: The Facts. Ottawa, ON: Author. Retrieved October 16, 2016. <https://secure.cihi.ca/free_products/health_care_cost_drivers_the_facts_en.pdf>. Danne, T., T. Battelino, P. Jarosz-Chobot, O. Kordonouri, E. Pankowska, J. Ludvigsson et al. 2008. "Establishing Glycaemic Control with Continuous Subcutaneous Insulin Infusion in Children and Adolescents with Type 1 Diabetes: Experience of the PedPump Study in 17 Countries." Diabetologia 51(9): 1594–601. Diabetes Control and Complications Trial Research Group. 1994. "Effect of Intensive Diabetes Treatment on the Development and Progression of Long-Term Complications in Adolescents with Insulin-Dependent Diabetes Mellitus: Diabetes Control and Complications Trial." Journal of Pediatrics 125(2): 177–88. Hofer, S.E., B. Heidtmann, K. Raile, E. Frohlich-Reiterer, E. Lilienthal, M.A. Berghaeuser et al. 2010. "Discontinuation of Insulin Pump Treatment in Children, Adolescents, and Young Adults. A Multicenter Analysis Based on the DPV Database in Germany and Austria." Pediatric Diabetes 11(2): 116–21. James Lind Alliance. 2016. "Priority Setting Partnerships: Diabetes (Type 1) Top 10." Retrieved October 18, 2016. <www.jla.nihr.ac.uk/priority-setting-partnerships/diabetes-type-1/top-10-priorities/>. Nathan, D.M., P.A. Cleary, J.Y. Backlund, S.M. Genuth, J.M. Lachin, T.J. Orchard et al. 2005. "Intensive Diabetes Treatment and Cardiovascular Disease in Patients with Type 1 Diabetes." New England Journal of Medicine 353(25): 2643–53. Nuboer, R. and G.J. Bruining. 2006. "Cost-Effectiveness of Continuous Subcutaneous Insulin Infusion (CSII) in Children: Illusion or Delusion?" Pediatric Diabetes 7(Suppl. 4): 39–44. Olsen, B., J. Johannesen, S. Fredheim, J. Svensson; Danish Society for Childhood and Adolescent Diabetes. 2015. "Insulin Pump Treatment; Increasing Prevalence, and Predictors for Better Metabolic Outcome in Danish Children and Adolescents with Type 1 Diabetes." Pediatric Diabetes 16(4): 256–62. Phillip, M., T. Battelino, H. Rodriguez, T. Danne, F. Kaufman; European Society for Paediatric Endocrinology et al. 2007. "Use of Insulin Pump Therapy in the Pediatric Age-Group: Consensus Statement from the European Society for Paediatric Endocrinology, the Lawson Wilkins Pediatric Endocrine Society, and the International Society for Pediatric and Adolescent Diabetes, Endorsed by the American Diabetes Association and the European Association for the Study of Diabetes." Diabetes Care 30(6): 1653–62. Shulman, R., F.A. Miller, D. Daneman and A. Guttmann. 2016a. "Valuing Technology: A Qualitative Interview Study with Physicians about Insulin Pump Therapy for Children with Type 1 Diabetes." Health Policy 120(1): 64–71. Shulman, R., M.R. Palmert and D. Daneman. 2012. "Insulin Pump Therapy in Youths with Type 1 Diabetes: Uptake and Outcomes in the 'Real World'." Diabetes Management 2(2): 119–38. Shulman, R., T.A. Stukel, F.A. Miller, D. Daneman and A. Guttmann. 2016b. "Resources and Population Served: A Description of the Ontario Paediatric Diabetes Network." CMAJ Open 4(2): E141–46. Shulman, R., T.A. Stukel, F.A. Miller, A. Newman, D. Daneman and A. Guttmann. 2016c. "Insulin Pump Use and Discontinuation in Children and Teens: A Population-Based Cohort Study in Ontario, Canada." Pediatric Diabetes. January 8 [Epub Ahead of Print]. Shulman, R., T.A. Stukel, F.A. Miller, A. Newman, D. Daneman, J.D. Wasserman et al. 2016d. "Low Socioeconomic Status is Associated with Adverse Events in Children and Teens on Insulin Pumps Under a Universal Access Program: A Population-Based Cohort Study." BMJ Open Diabetes Research & Care 4(1): e000239. Sulmont, V., V. Lassmann-Vague, B. Guerci, H. Hanaire, H. Leblanc, E. Leutenegger et al. 2011. "Access of Children and Adolescents with Type 1 Diabetes to Insulin Pump Therapy Has Greatly Increased in France Since 2001." Diabetes and Metabolism 37(1): 59–63.